100 million books sold in over 150 countries worldwide, and his works have been translated into 67 languages. The most uplifting and Poetic author of our times is back after 2 years. 'Anthology' comes from the Greek word that stands for garlands - a bouquet of flowers. An anthology then should be a sort of reminder of something else, a small token of something much larger. In the case of flowers, they bring with their fragrance and colorfulness the reminder of the fields, of a season. Coelho's anthology, therefore, is not only a collection of texts or poems, but a gift, something arranged according to his sensitivities, to give to others. The selection of books presented in this volume have been chosen as if from a vast field of flowers, stretching infinitely into time's horizon. Coelho's selection is ordered in to the four elements, symbolizing both our world on all its directions, and the way we dwell in this world, the way we say it. In 'Earth' we find writers as diverse as Oscar Wilde and D H Lawrence; in 'Air' Nelson Mandela and Gabriel Garcia Marques; in 'Fire' Rumi and Mary Shelley; in 'Water' Hans Christian Anderson and Machiavelli. 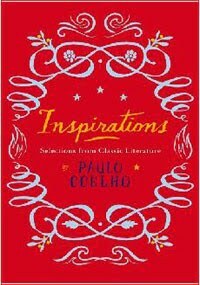 Catch Paulo Coelho''s new book INSPIRATIONS at 31% discount on Indiaplaza. Buy the book @ 31% savings! Deal of the Month: Paulo Coelho Collection @ 33% savings!